A firm critic of the IMF has warned the country may not see an affirmation from the IMF nor its executive, both linked to allegations of corruption, as a positive. South Africa should be wary of the “seal of approval” the International Monetary Fund (IMF) has apparently given President Cyril Ramaphosa, a critic has warned. 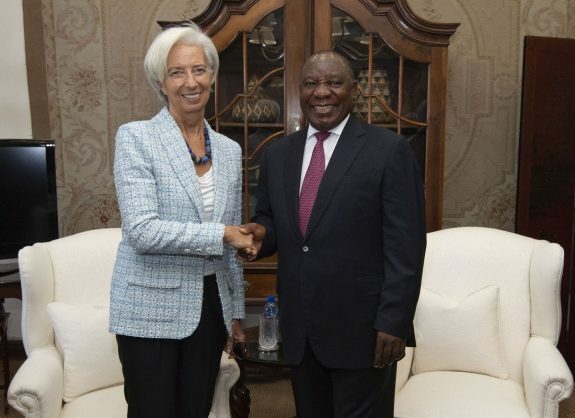 Its managing director, Christine Lagarde, gave a glowing report back following her visit to the country, which was part of her biannual African economies tour. Coinciding with efforts by Ramaphosa’s administration to attract investment, the visit was seen as a boost for Ramaphosa, whose Thuma Mina campaign in the ANC focused on reviving the economy and creating growth. Lagarde wrote off the possibility of a loan for South Africa in the foreseeable future. But political economist and professor at the Wits University School of Governance, Patrick Bond, a firm critic of the IMF, warned the country may not see an affirmation from the institution nor its executive, both of whom have been linked to allegations of corruption, as a positive. In 2016, Lagarde, a former French finance minister, was convicted of negligence over a €400 million (R6.6 billion) payment made to a business tycoon while she held office. Bond warned that the IMF’s track record was bleak, pointing to the recent financial meltdown in Ecuador. He said the election could not only be affected by the IMF’s endorsement of Ramaphosa, but the even more pressing need for debt relief in the country’s major loan repayments due next year. While Ramaphosa has not displayed an interest in loans from either the World Bank or the IMF, in favour of financial assistance from its Brics (Brazil, Russia, India and China) partners, it was troubling that both Finance Minister Tito Mboweni and South African Reserve Bank Governor Lesetja Kganyago looked more favourably to these institutions as both offices were in the era of President Thabo Mbeki. “Why do so many of these loans lead to a failure of delivery. The biggest loans we have had are those from the World Bank and the Development Bank of China.